Chelsea Heights is located near Confederation Park at 204 Alpha Avenue and 205 Beta Avenue in Burnaby. Built 48 years ago, the building was purchased by BC Housing in the spring of 2007, as part of the government initiative to preserve affordable housing for low-income families in Burnaby. New Chelsea Society was selected to manage it as of February 2008. Next door to the beautiful Confederation Park, this property is also near a public library, public swimming pool, elementary school, and a large commercial district with shopping and restaurants. 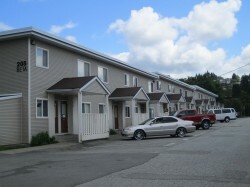 38 two-bedroom duplexes in two buildings for families. Nearby Confederation park, community amenities, elementary school and shopping. Rent geared to income for some tenants, who pay 30% of gross household income; all other tenants pay low end of market rates.